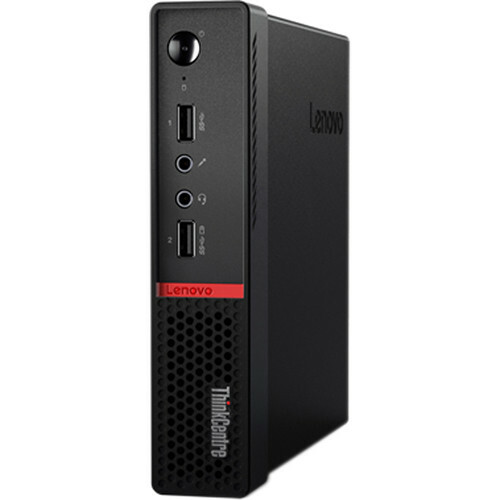 The Lenovo ThinkCentre M715q Tiny Thin Client harnesses the full potential of your network servers to provide processing and rendering performance for demanding workloads. The ThinkCentre M715q Tiny accesses the network using a Linux-based LeTOS v2 operating system and its Gigabit Ethernet or 802.11ac Wi-Fi connection. Once connected, the M715q handles the virtualized environment, created by a server or cloud, with an AMD Pro A6-8570E APU, 4GB of DDR4 memory, and 32GB SSD. The AMD Pro A6-8570E accelerated processing unit grants two computing cores, which operate between 3.0 and 3.4 GHz frequencies, along with an integrated AMD Radeon R5 Graphics chipset. The ThinkCentre M715q Tiny comes equipped with two DisplayPort outputs for supporting dual-monitor setups as well as three USB 3.0 and three USB 2.0 ports to access printers, external storage drives, and other useful devices. Other notable features include one built-in 1.5W speaker along with three audio jacks, powered by a Realtek ALC233-CG audio processor. There's also Bluetooth 4.0, so the thin client can wirelessly pair with headsets and mice. Box Dimensions (LxWxH) 19.6 x 11.2 x 7.0"